We would like to introduce to you the new application for online hotel bookings! 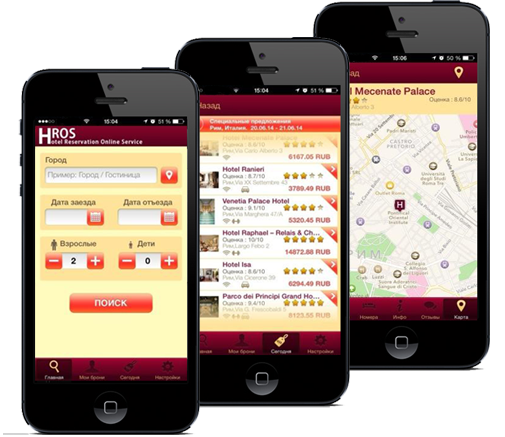 With the help of the booking application HROS you can choose out of the 510000 hotels the one that matches you best! In our database we have gathered the best deals on hotels in 64 000 cities worldwide. All you need is to enter exact dates of your trip and the first letters of the city or the hotel where you would like to stay. We do not store your credit card details! HROS transfers this information in encrypted form straight to the hotel. Your credit card is making your reservation guaranteed. You will pay for your stay by card or in cash directly at the hotel. If you do not know the city and unable to orientate around, use the built-in navigation system. The application will indicate how far away you are from the chosen hotel, as well as will show you other nearest hotels. Integration into the Passbook app! Information regarding your booking will be always available in the Passbook. Η εφαρμογή της ιστοσελίδας για το κινητό σου!